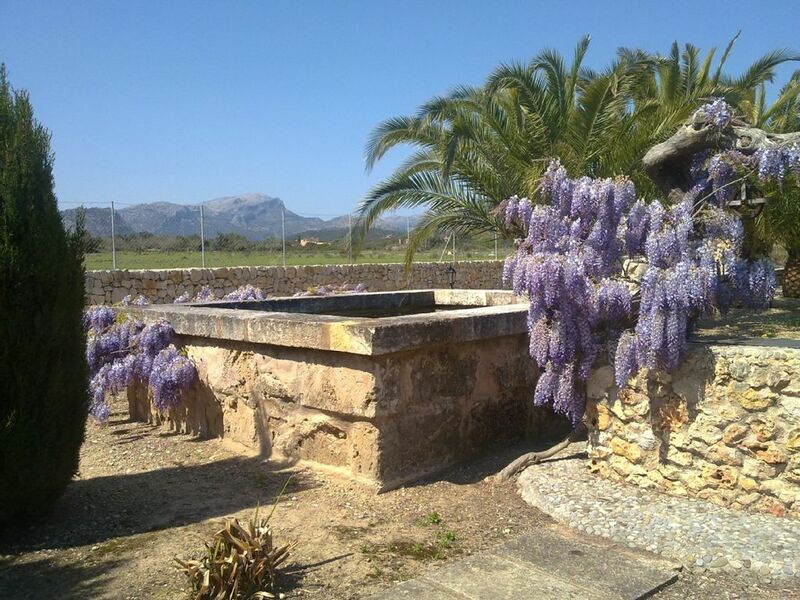 Right in the heart of the valley, between Pollensa and Pto Pollensa, you will find this comfortable country house with an olive tree plantation all around. The house offers the privacy and the peace that you need in your holidays. On the first floor (the tower) there is a double room with 5 windows from where you can enjoy the amazing view of the Tramontana mountain range. Outside and near the Roman swimming pool there is an ecological vegetable garden, where you can taste the vegetables and fruits for your barbecue and al fresco meals. The picturesque countryside around Pollensa is a colourful mixture of fertile fruit orchards and lightly wooded glades, bordered by hills to the south and dramatic rocky outcrops of Majorca's northern mountains. Contained within ten square kilometres, the region stretches along the coast to Alcudia from the golden beaches of Puerto Pollensa and inland to the quaint, historic small town of Pollensa itself. Summer and Winter fun: Pollensa has long been known as an idyllic summer destination with its long hot days and balmy nights. However, the winter sun provides an excellent tonic. It's an ideal time for visiting many of the island's treasures, or for walkers, cyclists, nature lovers, etc. Catch the almond or orange blossom between January and March. The nine hole golf course at Pollensa is also open all year round. Pollensa is an ideal location for bird watching especially during the migrating season as the area is in the migratory path. Pollensa Excursions: Caves of Drach (Manacor), Valldemosa and Deya, Palma city, Pollensa and Puerto Pollensa:- The picturesque countryside around Pollensa is a colourful mixture of fertile fruit orchards and lightly wooded glades, bordered by hills to the south and dramatic rocky outcrops of Mallorca's northern mountains. Contained within ten square kilometres, the region stretches along the coast to Alcudia from the golden beaches of Puerto Pollensa and inland to the quaint, historic small town of Pollensa itself. Both Puerto Pollensa and Pollensa offer a good selection of restaurants, ranging from cafes and tapas bars to fine dining. Pollensa, apart from its pretty square has the Via Crucis which is a notable attraction with its long stairway which ascends Calvary Hill, from which there are superb views over the coast. Xisca’s villa is in a beautiful traditional Majorcan style - set amongst a very large plot with orchards, grass areas, lots of loungers, seating, table tennis - lots of space and activities for all the family. The pool is a great size and depth - with stunning views of mountains and countryside in every direction. Had such a fantastic time here - the children want to move here! They have enjoyed feeding the chickens and foraging for fruit in the orchards. Xisca is an exceptional host who met us at the start of our stay and has been very helpful with everything we needed. There are not many places that we would normally ever considering coming back to in that we like seeing new places - but this villa is definitely one we would love to stay in again. For anyone who wants to get away to a beautiful rustic retreat that is less than 10 minutes drive to Pollença and Port de Pollença this is the place for you. Setting and villa itself is fantastic with a nice size pool and BBQ! Owners are really friendly and helpful. If you are looking for a stay that is in the middle of nowhere with stunning views and rural charm then this place is great. Kids(1&4) loved the pool and grounds plus there are chickens and turkeys on neighbouring land which enjoy being fed in the evening, which gave the kids some fun watching the chickens running around. The owners also provided us with a welcome hamper with milk, bread, bottled water, meat and cheese plus a tray of fruit and loads of eggs from their chickens! We had a lovely holiday at this property. It is set in a quiet ,rustic location ,the children loved the chickens in the olive grove ! The house is comfortable and well equipped, with a lovely pool area to rest and for the children to play. It was also very clean and tidy . Xisca very kindly had left some food for us on arrival including very tasty eggs from the free range chickens. It was very appreciated as we arrived during the evening on a Sunday. We would love to come back to Sa Torreta. We stayed at this beautiful villa which is set off a country road but within 7>10 mins drive from Pollenca and Porto Pollenca. The villa is as described in the listing but even better in reality. The pool is magnificent as are all the facilities that are included in the property, the outdoor kitchen with a fantastic BBQ and the table tennis which we all had great fun playing. The property was spotlessly cleaned and the owner Xisca met us on arrival to show us around and provided a beautiful welcome pack of fresh fruit, eggs from the resident hens. The area is rural and peaceful with only the sound of the birds and bees to listen to.A car is essential but there are beautiful walks just outside the gate. We did not have to use the A/C as there was a beautiful breeze that kept the pool area cool and slept with the windows opened, just perfect ! We would highly recommend this villa and hope to return in the near future. Thank you Xisca for a wonderful holiday. It was a pleasure to meet you and I want to thank you for your kindness. I hope to see you again in the future. This villa is set in a rural community with the mountains and fields in the background. The grounds of the villa houses the chickens, olive trees and a vegetable garden. The villa itself is furnished to a high standard and was very clean, I particularly liked the lack of rules (you usually get a 'Do not' list in most villas) and if there was anything wrong, the owners are only a phone call away. The most enjoyable thing was of course, the swimming pool (please note there is no shallow end although there are large steps) and the large BBQ area where we spent most evenings chatting, drinking and playing games. (Really pleased that there were no mosquitoes bothering us in the evenings) The owners treat their guests with respect and courtesy and I particularly liked the welcome pack which meant you didn't have to rush to the supermarket after the journey there. During our weeks stay, we visited the nearby towns of Pollensa and Alcudia which are within close driving distance and given that you can join the main motorway in Alcudia, most parts of Majorca are therefore easily accessible. There were lots of lovely places to eat in both these towns which were reasonably priced despite the Euro exchange rate. A car is necessary if you want to stay here and the 4.5 km drive to the main road can be a little challenging given the narrow country roads. We had a wonderful holiday at this lovely finca. The owners, Kika and Miguel, could not be more welcoming or helpful. We were left a generous welcoming pack and during our stay were provided with the most delicious fruits and tomatoes from Miguel’s ecological garden. Sa Torreta is full of character and provides a lovely setting for a relaxing Mallorcan holiday with beautiful views of the mountains beyond picturesque Pollensa town. This was a lovely secluded place to chill out. The pool was wonderful and the finca had everything we wanted, including the comfort of air conditioning if the nights became a little too hot to sleep. The climax of the day was to have a barbeque on a barmy evening, eating outside and drinking some of the lovely Mallorcan wines as the sun set, with the pool and outside lights illuminated to create so much atmosphere. We enjoyed feeding the chickens and it was nice to give something back for the delicious fresh eggs that Miguel again kindly provided us with. Pollensa town, which is a lovely place to visit and to eat out is just a very short drive away, as are some lovely beaches. Some days it was nice just sit by the pool and read and swim, on others a trip to a nearby market was just the thing. We can fully understand why Kika gets so many repeat bookings for Sa Torreta and we would certainly like to comeback again for what was undoubtedly a lovely Majorcan family holiday. Thank you to you and Miguel; for all of your kindness and hospitality. Pollensa is without doubt one of the most attractive towns of the island. From the scenic point of view, Pollensa is full of contrasts because a large part of the Serra de Tramontana is situated within the old town. During all year, one can enjoy a variety of musical events. The picturesque countryside around Pollensa is a colourful mixture of fertile fruit orchards and lightly wooded glades, bordered by hills to the south and dramatic rocky outcrops of Mallorca's northern mountains. Contained within ten square kilometres, the region stretches along the coast to Alcudia from the golden beaches of Puerto Pollensa and inland to the quaint, historic small town of Pollensa itself. To the north the shores of Puerto Pollensa and Cala San Vicente are fringed with kilometres of golden sand with water sports and ideal sun bathing for the more relaxing holiday. Both Puerto Pollensa and Pollensa offer a good selection of restaurants and cafés. Golf: The golf course Pollensa is situated only 3 km far from the villa. Pollensa Golf and Alcanada Golf: The house is situated only 5 minutes by car from the Pollensa Golf. The fabulous Alcanada Golf Course is only 15 minutes drive from the villa. Pollenca Golf Course is also only a five minute drive from the villa. Though smaller than Al Canada, this is a lovely picturesque course. The Pollensa Golf Club is open not only to members. The challenging 9 hole courses have been described as some of the most beautiful in the Mediterranean, with a clubhouse, a restaurant which also welcomes non-golfers, a swimming pool, rental of clubs, trolleys and golf cars also available. Tuition can be arranged and there are regular tournaments.